In this article, I want to talk about Prepaid Wireless and Portable or Personal Hotspot. 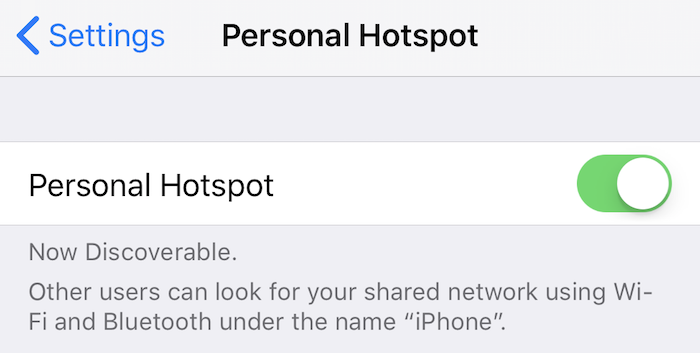 Hotspot lets you share your phone’s cellular data internet connection with with your computer, tablet, TV, or other devices using a Wi-Fi connection. I’ve heard from many readers that are Straight Talk customers and want to use hotspot. Unfortunately, use of Hotspot violates Straight Talk’s Terms and Conditions of service, See Prepaid Wireless and Personal or Portable Hotspot. Some people are angry that even though hotspot is enabled on their phone, their service may be suspended or terminated for using the feature. I think it would be great with Straight Talk offered Hotspot as part of their smartphone plans, but they don’t. Rather than get upset about it I recommend you simply switch to a prepaid wireless carrier that offers Personal or Portable Hotspot. Many other prepaid wireless companies offer hotspot as a feature. Below is a list of prepaid wireless carriers that support hotspot with some additional details about the feature. Before choosing a new carrier though, consider how you plan to use hotspot to make sure that the the plan you pick meets your needs for hotspot. Most carriers offer hotspot with a fixed amount of data, not unlimited data. They expect you’ll use hotspot to connect your laptop, tablet, or other device to the internet occasionally when you are away from home or the office. A growing number of people I hear from want to use hotspot to replace their home broadband internet connection. They want to eliminate the need for a high-speed internet cable, fiber, or DSL connection at home. Some live in areas where a wired home internet connection is very expensive, or there is little to no choice. They want to use their mobile phone as a hotspot to provide internet for all their computers, tablets, TVs, and gaming consoles. Unfortunately no wireless carrier offers this option in 2018. The current 4G LTE network technologies the wireless companies use wasn’t designed for this. Using 4G LTE this way, puts a huge strain on their networks. Moving forward, the 5G network technologies that the carriers are going to roll out may provide hope for this kind of service. Currently I am only aware of one company that offers unlimited mobile hotspot and that is Verizon prepaid, see the description below. The rest offer fixed amounts of data on unlimited plans or you’ll pay for the additional data you use on fixed data plans. You can use Personal or Portable Hotspot with Verizon Wireless Prepaid. With Verizon’s fixed data plans you can use all of your data up to your plan’s limit with hotspot. If you need more data, you can buy add-on data. With Verizon Prepaid’s Unlimited plan, you can use an unlimited amount of data with personal or portable hotspot. However, with hotspot, the data will be slower than the speeds you normally see on your phone. Verizon sets a limit, or maximum download speed of 600Kbps for hotspot. You can also use Personal or Portable Hotspot with AT&T Prepaid. With AT&T’s fixed data plans you can use all of your plans data, up to your plan’s limit for hotspot. If you need more data, purchase add-on data. AT&T prepaid has two unlimited plans. The less expensive plan, does not include hotspot. The other unlimited plan, which is $20 more per month includes up to 10GB data for hotspot. Simple Mobile includes Personal and Portable Hotspot with all of its fixed data plans and one of its unlimited plans. If you are on a fixed data plan, you can use up to your entire amount of data with Hotspot. If you use up all your data, you can use their add-on data feature to buy more. Simple Mobile has two unlimited plans. The plan that supports hotspot will let you use hotspot costs $10 more per month and you can use up to 10GB per month with hotspot. Cricket Wireless offers Personal or Portable Hotspot as $10 add-on feature. For Cricket’s Fixed Data plans you can use all of your high speed data with Hotspot, after you use up your data hotspot will still work at the lower 128kbps speeds. Cricket has Unlimited and Unlimited Max Plans both of which let you use up to 10 GB of data with hotspot. After 10 GB, your data speeds are slowed to 128Kbps. Note that with Cricket all plans have a maximum download speed of 8 Mbps except for the Unlimited Plan which has a max download speed of 3 Mbps. The Unlimited Max plan has a maximum download speed of 8 Mbps. Also note that with Cricket even though Hotspot is a $10 per month add-on, that means you only need to pay for it during the months you want to use it. Metro PCS includes hotspot as part of all their fixed data smartphone plans and one of their unlimited data plans. For the plans, with fixed data, you can use up to the full amount of high speed data with hotspot. After that, you’ll have reduced speed data with both your phone and hotspot. Metro PCS two unlimited plans but the one with hotspot cost $10 more per month. You can use up to 8 GB of high speed data with hotspot, after that hotspot will still work at reduced speeds. Google Project Fi includes hotspot. The service uses a combination of the T-Mobile, Sprint, and US Cellular networks. With Fi, you’ll be able to use hotspot, but with Fi you pay for all the data you use. Currently, it costs $10 per 1GB up to 6GB. At 6GB or more you’ll pay $60 per month(for data). The plan details and FAQ are not clear about what happens with hotspot. Does this mean you can effectively have unlimited hotspot on Fi for $80 per month ($60 for data plus $20 for talk and text). Boost Mobile also includes hotspot with their plans. They use the Sprint network. All of their plans support hotspot. Their fixed data plan will let you use all of your high speed data for hotspot. After all of your high speed data is used, you’ll have reduced speed data. Boost Mobile has three different unlimited plans for $50, $60, and $80 per month. The plans include 8 GB, 20 GB, and $40 GB of hotspot per month. Mint SIM also includes mobile hotspot. The company uses the T-Mobile network. Mint SIM only offers fixed data plans and with all of these plans you can use up to your entire amount of high speed data with hotspot. After you used your high speed data, you can still use reduced speed data with hotspot. Note that you’ll probably find that hotspot will be too slow if you use it with any of these plans on reduced speed data. I’ll update the list over time. I am sure I missed a few carriers. It might work with some combinations of phones and different Tracfone towers, but its not a supported feature. Given that tracfone includes a limited fixed amount of data with their plans, or you need to pay for add on data, they may not spend much effort enforcing their policy. Hi – Any idea what the speeds are for a standalone StraightTalk hotspot. Not the hotspot on a phone but the one that is its own hotspot. I am trying to compare those speeds to Verizon prepaid. I haven’t tried it myself. If the hotspot device is 4g lte is suspect the same as on a phone. The hotspot plans have fixed amounts of data so there is no need to limit the speed. I don’t know how often they come out with new hotspots that support the latest cellular lte bands. I use netbuddy. They apparently are a AT&T MVNO. I get completely unlimited data with no contract and it’s great. I’m like at 100 gbs so far. Cool. Are using it with a phone as a hotspot or in a dedicated hotspot device?